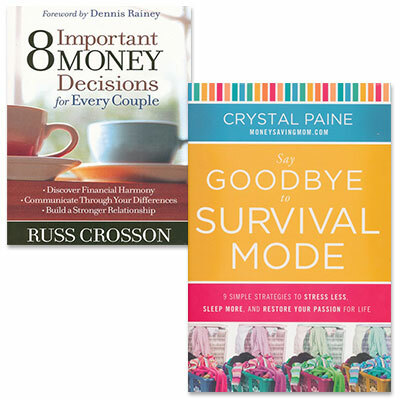 Purchase Say Goodbye to Survival Mode and 8 Important Money Decisions at a special price. You know you're made for a more fulfilling life. With this book, you’ll know where to start. You wake up tired. Your to-do list is too long. The commitments—and the laundry—are piling up, but your energy keeps dwindling. You feel like you're simply making it through the days, not living or enjoying any part of them. In Say Goodbye to Survival Mode, you'll find both practical ideas and big-picture perspective that will inspire you to live life on purpose. Every marriage has conflict. And many of those conflicts are related to finances. Russ Crosson, president and CEO of Ronald Blue & Co., shows readers how to avoid the potentially disastrous landmine of financial turmoil. To avoid pitfalls, Russ offers a game plan couples can use to achieve harmony in their marriage, no matter what their financial situation.